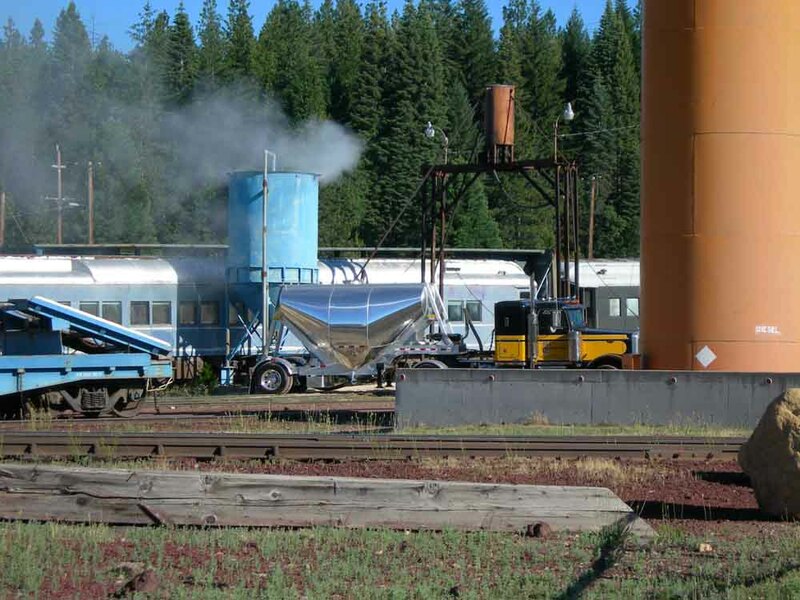 The McCloud River Railroad maintained a classic locomotive sanding facility adjacent to the McCloud turntable through the steam era. In 1957, the railroad started building a new sanding tower to supply the diesel locomotives then coming into service. A hopper constructed next to the tower stored sand, and the McCloud shop built a sand car to transport sand to McCloud. When empty, the railroad would haul the car to one of the connecting carriers, who would fill the car and return it loaded to McCloud. 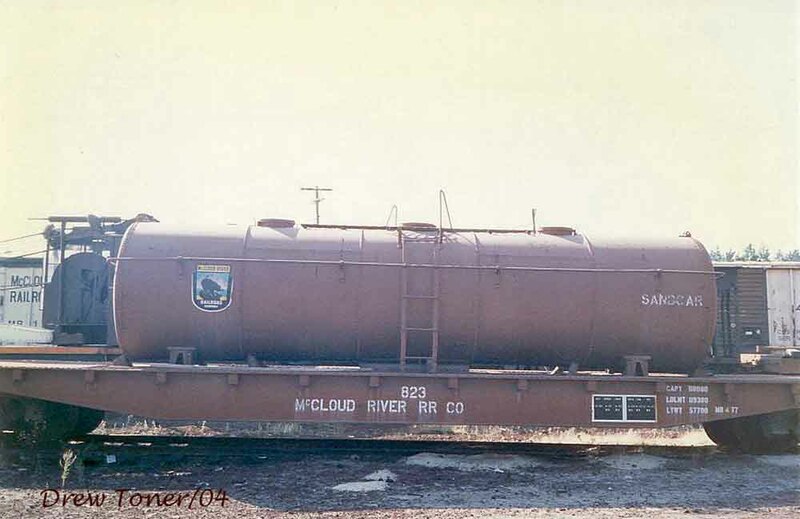 A second sand car replaced the hopper by the late 1970s, and then a new hopper constructed by the McCloud Railway replaced the sand cars altogether. Converted 11/21/1957 from fuel tank car #2002, with trucks swapped with log flat #2983 to make the car legal for interchange. Conversion costs of $1046.33. Car survived in that form until 1977, when the railroad removed the body from the tank car frame and mounted it on flat #823. Sand car #503 sitting next to the sand tower in 1959. Photo by and courtesy of Ed Burggraf. Another view of #503. Photo from the Travis Berryman collection. Converted 7/1972 from maintenance flat #821. Consisted of an 8,000-gallon tank car body, probably salvaged from #2005, #2008. #2010, or #2011, mounted on the flat. Referred to as #504 after 1977 in The Official Railway Equipment Register, though photographs show the car only stenciled as #821. Sold to McCloud Railway in 1992. Retired 1993, with the #821 converted to equipment transport flat #821. 17 Sept 1982. Photo by Jimmy Bryant, courtesy Nevada Historical Society. The #821 in 1984. Pat Holden photo, Jeff Moore collection. McCloud, CA, 5/2007. The former sand car body as it appears today, rolled upside down at Ash Creek Junction. Built 4/1977 by mounting body from #503 onto maintenance flat #823. The Official Railway Equipment Register continued to show this car as the #503 after the conversion, though photographic evidence shows this car only stenciled as the #823. Dismantled circa 1988, with sand car body removed and flat returned to work service. The #823 spotted next to the sanding towner on 17 September 1982. Photo is by Jimmy Bryant and is courtesy of the Nevada Historical Society. Photo was taken 1986 and is by and courtesy of Drew Toner. The replacement for the sand cars at work in June 2006.